How does the DCISionRT test benefit me? DCISionRT allows you and your physician to choose a treatment approach using your underlying biology. The test indicates your individual risk of recurrence so that you can decide with your physician the best treatment path for you. It is important to balance treatment risk with treatment benefit to avoid unnecessary side-effects. Patients indicated as low risk may not benefit significantly from additional treatment whereas patients in the elevated risk group are more likely to benefit significantly from additional treatment. Ductal carcinoma in situ (DCIS), frequently identified through a mammogram, is a condition of abnormal cells in the lining of the milk ducts within the breast. 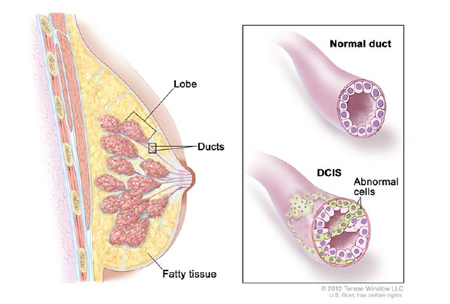 DCIS occurs in about one of every five breast cancer diagnoses. It can be a serious diagnosis, depending on many factors, including family history, genetic markers and prior medical history. There are numerous excellent sources of information on DCIS, its diagnosis and treatments. However, the best source of information is thorough consultation and collaboration with your physician, and their experienced and knowledgeable teams of qualified healthcare professionals. DCISionRT uses tissue from a breast biopsy or surgery to provide an individualized risk profile based on your tumor biology. DCISionRT is intended to be used in conjunction with your physician’s standard workup to help make a personalized treatment recommendation. Your biological profile is combined with clinical and pathologic risk factors using the DCISionRT algorithms to determine your individualized risk profile. This helps you and your physician understand your risk of recurrence over the next ten years.